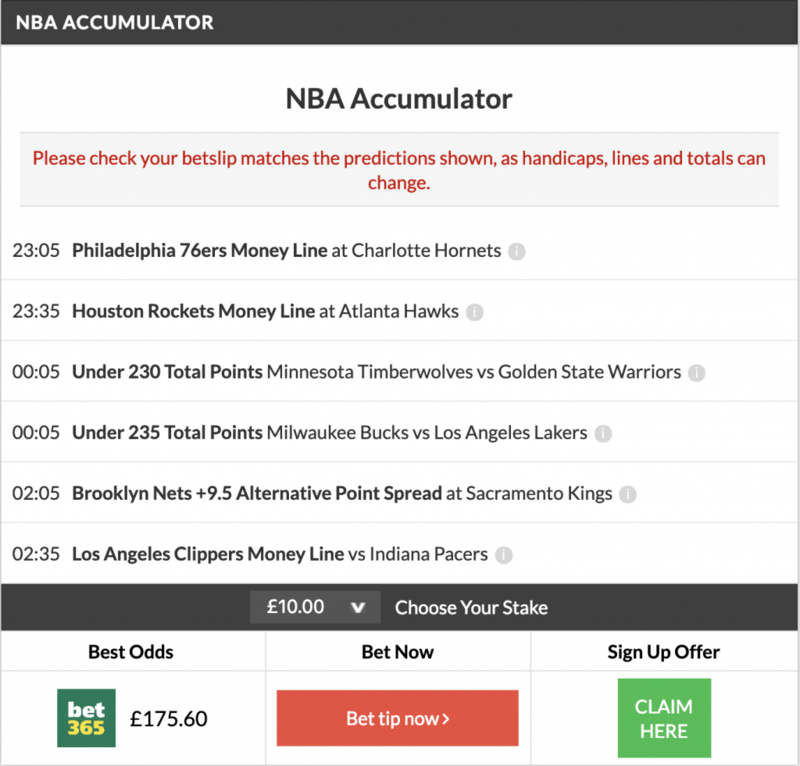 16/1 NBA Accumulator + Double land on Tuesday night! Our NBA Tipster is on fire here at FST! In the past 7 days he has now landed three accumulators (15/1 Acca & 19/1 Acca) and five doubles! Proper way to start the day! Despite not having Joel Embiid in the line-up, the Philadelphia 76ers got the job done at Charlotte against the Hornets. Foud players scored 20+ points for Philadelphia as they came out on top in a 118-114 thriller. Led by James Harden, the Houston Rockets put up 121 pts against the Atlanta Hawks which was enough to get the win. It was Houston’s 45th win on the season as they continued to climb up the Western Conference standings in preparation for the playoffs. Golden State’s big 3 scored the majority of their points in the win at Minnesota last night. We went for Under 230 pts in this one and it came in as the game finished 117-107. It was the Warriors’ 24th win on the road this season in 36 games. LeBron James did not play for the LA Lakers as they suffered yet another loss to the Milwaukee Bucks. Without LeBron it was always going to be a low scoring game and we went for just that. The game ended at 216 combined points landing our Under 235 Total Points bet with ease. A huge 4th quarter by the Brooklyn Nets saved us in the 5th game of the Acca. The Nets were down by as many as 25 pts in the final period of the game, but they put up 45 pts on the Kings in the final 12 minutes to record a 123-121 win, landing our +9.5 Point Spread with no issues. Russell scored 44 pts for the Nets! And finally, we backed the LA Clippers to get the home win against the Indiana Pacers in the final game of our acca and they did just that! Indiana struggled here as they still miss their star player Victor Oladipo. Six players scored in double figures for the Clippers who recorded their 42nd win on the season, but more importantly landed yet another NBA acca for us! The NBA regular season is coming to an end soon, but that won’t stop us! Bookmark the FREE NBA TIPS page so you don’t miss out on any future winners! Tips usually go up on the website in the afternoon hours! Categories: Blog, NBA, and Tip Results. Sports: NBA.